OMEGA™ push-in crimp-style contacts are manufactured from thermocouple alloy materials and are color-coded for easy identification. Contacts are crimp-terminated outside the connector assembly and inserted into the appropriate cavity by means of an insertion tool. They can be readily removed from the connector assembly using a special removal tool. Sealing plugs are available to seal unused positions in lieu of pin or socket. * For use with non-thermocouple wire in same body. Grommets available. Consult Sales Department for price and delivery. † Pins have red, yellow and brown color bars; sockets have red, blue and black color bars. Note: Pins have red, yellow and brown color bars; sockets have red, blue and black color bars. 1. MS Standard Assembly Tools are required to crimp and assemble connectors properly. Order with first purchase. 2. 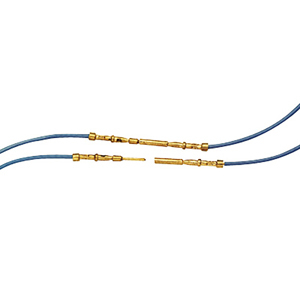 Match pins and sockets to thermocouple alloys–Example: A 12-cavity connector carries 6 thermocouple circuits (pairs) requiring: 6 positive alloy pins or sockets and 6 negative alloy pins or sockets per body. 3. Order bodies in mating pairs. Style MC mates with both style FF and style FC. 4. Backshell cable clamps are recommended with each cord style connector.